Tinuku - After US$2.3 billion in funding from the likes of Google, JPMorgan, and Alibaba, and years of outlandish hype, startup Magic Leap is finally revealing its mysterious, futuristic mixed reality (MR) device – Magic Leap One. The Magic Leap One Creator Edition, the first mixed reality headset from startup Magic Leap, is shipping today in “select areas” in the United States for $2,295. The Creator Edition isn’t quite a development kit, Magic Leap CEO Rony Abovitz calls it a “full-blown, working consumer-grade product,” and AT&T has said it will show demos at some stores. But it’s primarily aimed at artists and app developers, who can try a limited suite of experiences and develop their own apps for the Magic Leap World store. Would-be buyers can go to Magic Leap’s website and search for their zip code. If Magic Leap is operating in the area, the company will deliver the Magic Leap One for free, complete with help setting the system up and fitting the headset. If it’s not, people can sign up for a waitlist. Buyers can add an optional $495 “professional development package” that includes a system for replacing the device within 24 hours if it breaks. 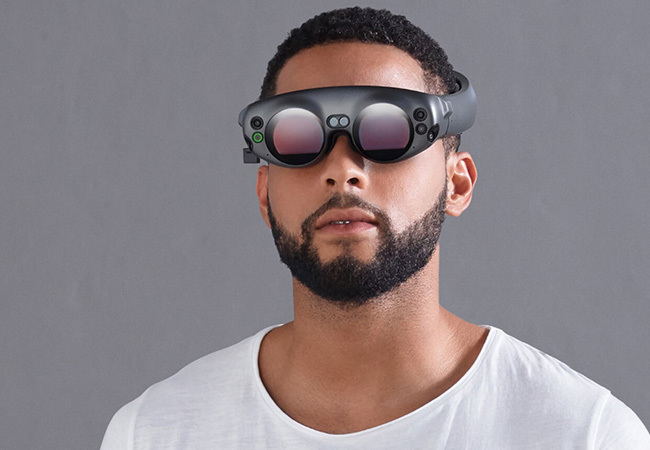 As Magic Leap has previously revealed, the Magic Leap One is a three-part device consisting of glasses called Lightwear, a wearable computer called the Lightpack, and a handheld controller. The Lightwear uses a combination of tracking cameras and a lens called a “photonics chip” to project images over the real world, while the Lightpack features an Nvidia Tegra X2 mobile chipset, 8GB of memory, 128GB of storage, and a battery that’s supposed to provide up to 3 hours of continuous use and charges over USB-C. There’s a headphone jack, but by default, the Magic Leap One uses small speakers built into the sides of the headset. 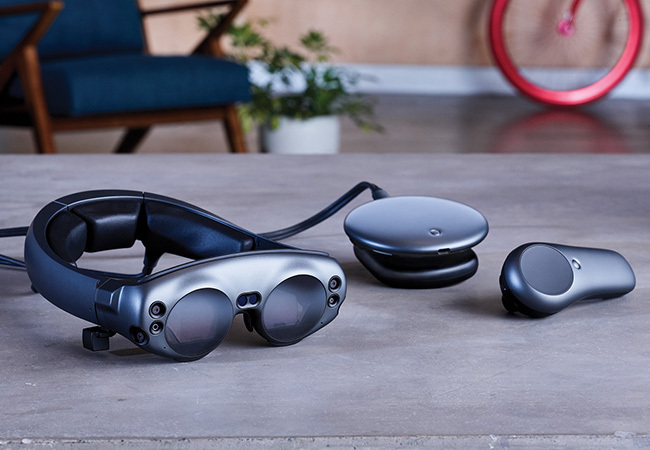 While Magic Leap has signed a deal with AT&T for mobile data service in the future, the Magic Leap One only features Bluetooth and Wi-Fi connectivity, and it’s meant for indoor use, although Abovitz says it can work “under certain conditions” outdoors. It comes with a suite of apps intended to be used indoors: there’s a web browser called Helio; a “social suite” that includes a virtual chat system; apps for placing virtual objects and screens; and a working demo of Dr. Grordbort’s Invaders, a game similar to a concept video it produced with special effects studio Weta Workshop in 2015. The Magic Leap World store will also include an art tool called Create, a preview of an NBA app, and the musical Sigur Ros collaboration Tonandi. And developers can get access to source code and assets from Magic Leap experiences, to help in their own work. Magic Leap already runs a portal for developers with tutorials and a software development kit. The Magic Leap One seems like an ambitious and well-built piece of hardware that’s still held back by technical limitations. The design is a lot more comfortable than it looks, especially because it comes in two sizing options with several different forehead and nose rests to change the angle and distance of the lenses. But the Magic Leap One’s 50-degree diagonal field of view, while larger than the competing Microsoft HoloLens, is still extremely limited. And the image quality feels roughly on par with the two-year-old HoloLens. 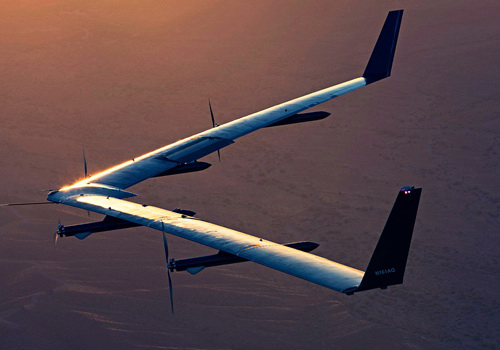 It’s generally good, but with some tracking and transparency issues.